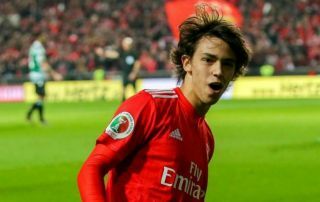 A whole host of European giants including Man Utd and Chelsea reportedly scouted Joao Felix on Thursday night, but they will have to dig deep into their pockets to sign him. The 19-year-old didn’t disappoint as he bagged a hat-trick in a 4-2 win over Eintracht Frankfurt, taking his tallies to 15 goals and seven assists in 36 appearances at both youth and senior level so far this season. There is little doubt that he has a very bright future ahead of him if he continues to develop and improve, and it’s no surprise that interest is said to be building in him from around Europe. As noted by Mundo Deportivo, it’s claimed Man Utd, Juventus, Inter, Bayern, Chelsea, Tottenham, Arsenal, Leicester City, Manchester City and Barcelona were all represented at the Europa League game on Thursday night, and it’s suggested that Joao Felix and Luka Jovic were the names that stole the show and were of particular interest. However, it’s added that the talented Benfica youngster has a €120m release clause in his current contract which runs until 2023, and so it’s fair to say that the Portuguese giants are in a strong position to either keep him, or to demand a significant fee for him this summer. It remains to be seen who is convinced to splash out on the starlet, but the calibre of the teams mentioned above would suggest that Felix is undoubtedly on the right path to getting a big move at some stage in the future. It does arguably remain a gamble for the time being though, as he has yet to prove that he can deliver at the highest level on a consistent basis, and so many of the teams mentioned as potential interested parties will surely still be slightly apprehensive about making a big-money offer so soon.